It is a mineral of Silicate. 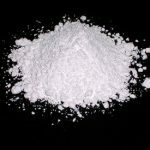 By definition, Andesine must have 50 to 70 percent Sodium and 30 to 50 percent Calcium in the Sodium/Calcium crystal structure. The chemical formula of this mineral is (Ca, Na)(Al, Si)4O8,where Ca/(Ca + Na) (or percent of Anorthite) is between 30 and 50%. It is mostly found in magmatic and metamorphic environment. 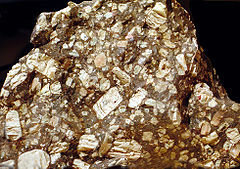 It typically occurs in metamorphic rocks of granulite, usually showing antiperthite property. It occurs in the form of intermediate igneous rocks such as Diorite, Andesite and Syenite. This substance is also found as detrital grains in sedimentary rocks. This chemical is closely related with Quartz, Potassium Feldspar and Magnetite. The mineral consists of Sodium (5.14%), Calcium (5.97%), Aluminum (14.06%), Silicon (27.18%) and Oxygen (47.65%). It belongs to Tectosilicates subclass and Plagioclase Feldspars group. The Plagioclase group refers to minerals that include in their chemical composition from pure Albite to pure Anorthite. It was first found in 1841 in a mine at Marmato, Colombia. The name of this substance comes from abundance of Andesine lavas in the Andes Mountains, South America. This mineral is also known by other names such as Ab60 and An40. It can be colorless, gray, yellow-green or white in color. Its molecular weight is 268.6 (grams per mole). Being a member of the plagioclase feldspar solid solution series, accurate measurement of each individual varies. Refractive indices and specific gravity of this chemical increases directly with the Calcium content. Density : 2.66 and 2.68. It has an average density of 2.67. Specific Gravity : 2.68 to 2.71. Hardness : On Mohs scale is 6.25. Transparency : It is transparent, subtransparent or translucent. Luster : vitreous to dull if weathered. Luminescence : It is non-fluorescent. Magnetism : Nonmagnetic in nature. Fracture : It is uneven and conchoidal. The cross-section of these crystals is nearly rectangular or square with marginally slanted dome and pinacoid endings. Crystals can be usually twinned as per Albite, Baveno, Manebach and Carlsbad laws. This substance is found in regions like Greenland, Andes Mountains and Norway. Andesine is chiefly used as a gemstone. Earlier, this gemstone was supposed to be better when left untreated. Today, however, heat treatment is commonly used to process this material and bring out its true color. The gemstone is also used in engraving and in art works like decorative boxes. This stone is also used in ceramic industry and in tiles, stones and bricks. Red Andesine-Labradorite has a rich red color and glow and commands a premium. Andesine-Labradorite is difficult to find and appears in very limited quantities. The naming convention of Andesine Labradorite is disputed. It is not strictly Andesine by definition. The stone is believed to be Feldspar with composition that falls between Andesine and Labradorite in classification. Andesine is usually priced between $80 to $200 per carat, depending on color, clarity and size.